"You are almost sure to have the only three ingredients needed to make this quick treat on hand. Be careful, this thick shake can be addictive!" Place ice cream, milk, and peanut butter in a blender; blend until smooth, 45 seconds. Delish! Tastes like a lot like a peanut buster parfait. Quick easy and a great reason to buy some ice cream! 45 minutes seems like a long time to have something in the blender but i'm willing to try it because it sounds yummy. I don't have anything else to say other than,DELICIOUS!!!! I decided to add half of a banana, and that made it even better! Loved the recipe. Better than the local burger joint! I made this using Trader Joe's Cookie Dough Peanut Butter. OMG! 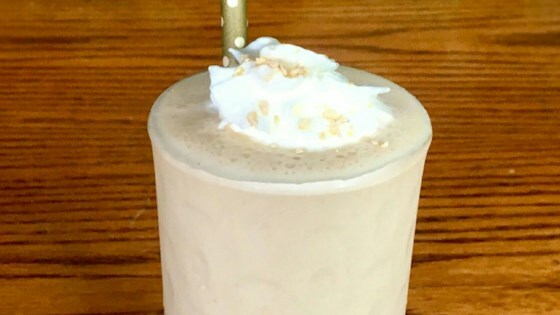 very creamy, peanut buttery, yummy drink!! so good! !